This is the old-styled reproduction version of VT-22's squadron patch. The "King Eagles" of VT-22 fly the TA-4J and T-45A Goshawk out of NAS Kingsville, TX. They trace their lineage to 13 June 1949 when Advanced Training Unit (ATU) Six was formed at NAS Corpus Christi, TX. They changed names and locations several more times until August 1970 when their name and base became what it is today. This is the color version of VT-22's squadron patch. The "King Eagles" of VT-22 fly the TA-4J and T-45A Goshawk out of NAS Kingsville, TX. They trace their lineage to 13 June 1949 when Advanced Training Unit (ATU) Six was formed at NAS Corpus Christi, TX. They changed names and locations several more times until August 1970 when their name and base became what it is today. 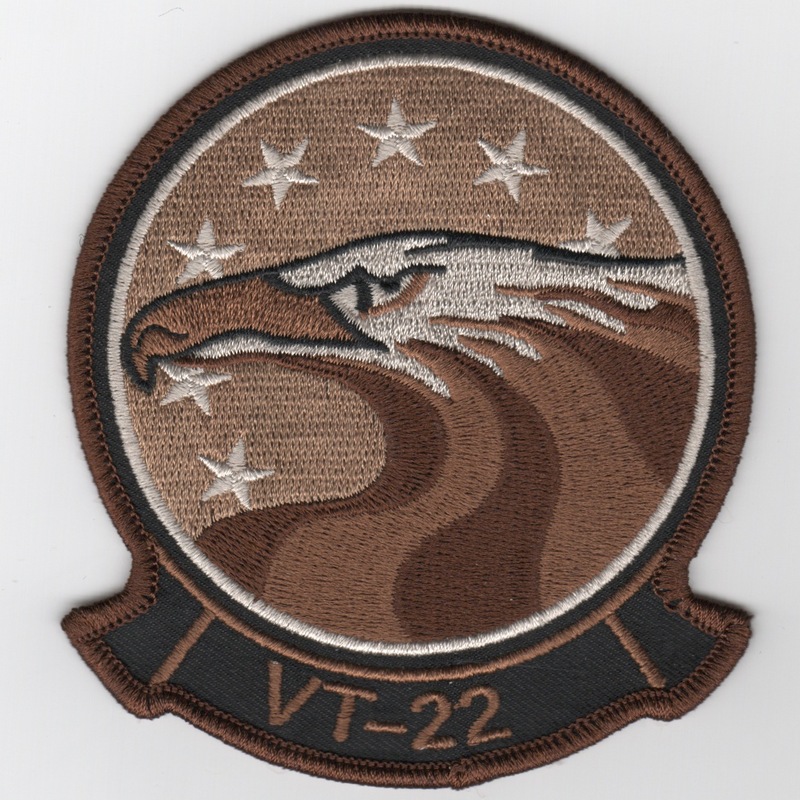 This is the desert version of VT-22's squadron patch. The "King Eagles" of VT-22 fly the TA-4J and T-45A Goshawk out of NAS Kingsville, TX. They trace their lineage to 13 June 1949 when Advanced Training Unit (ATU) Six was formed at NAS Corpus Christi, TX. They changed names and locations several more times until August 1970 when their name and base became what it is today. 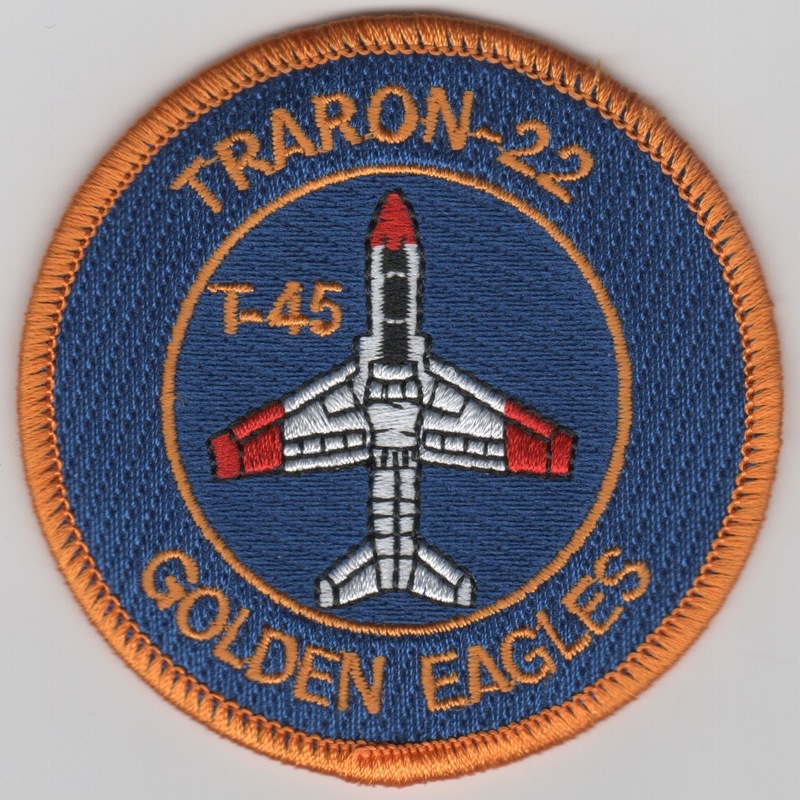 This is the color version of VT-22's T-45 Goshawk aircraft 'bullet' patch. The "King Eagles" of VT-22 fly the TA-4J and T-45A Goshawk out of NAS Kingsville, TX. They trace their lineage to 13 June 1949 when Advanced Training Unit (ATU) Six was formed at NAS Corpus Christi, TX. This patch does not come with velcro attached. Homepage | Order VT-22 Patches!